The star is a well-known and beloved symbol of Christmas. We put a lit star on the top of our star-decorated trees. Christmas cards show a star hovering over the manager of baby Jesus and sugar cookies are cut in the shape of a star. Homes and businesses used to have lit stars for decorations and farmers sometimes had one on a silo 60′ feet in the air. 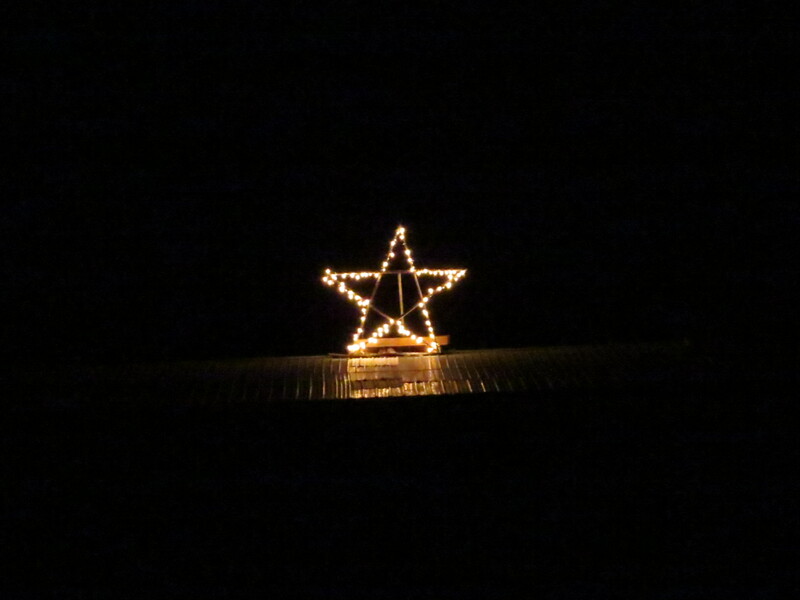 I love the star and we have one on the stable on the hill in our front pasture overlooking a major thoroughfare-Route 60. I light it the day after Thanksgiving as a reminder to people the true meaning of Christmas. When we ride the roads in December I look for stars and wonder, where have all the stars gone? Gaudy Santas, sleighs, reindeer, trees, candy canes and gifts have replaced the Christ-child, angels, stars, managers and worship. Lies confuse truth, the fear of offense squelches the joy of the sacred and the holiday of gross commercialism has stolen the “reason for the season”. In reality the star was not present at the stable where baby Jesus was born. Matthew 2 very clearly tells the story of Wise Men coming from the East when Jesus was about two years old. They were astrologers, wise men or magi who studied and gazed at the stars. Since the dawn of recorded civilization, stars played a key role in religion and proved vital to navigation. Ancient cultures saw patterns in the heavens that resembled people, animals or common objects. Job 9:9 and Amos 5:8 mention the names of several stars; the Bear, Orion and the Pleiades. The magi knew and understood the orbit of the sun, moon and planets. They also knew and understood the ancient prophecies about the coming Messiah. 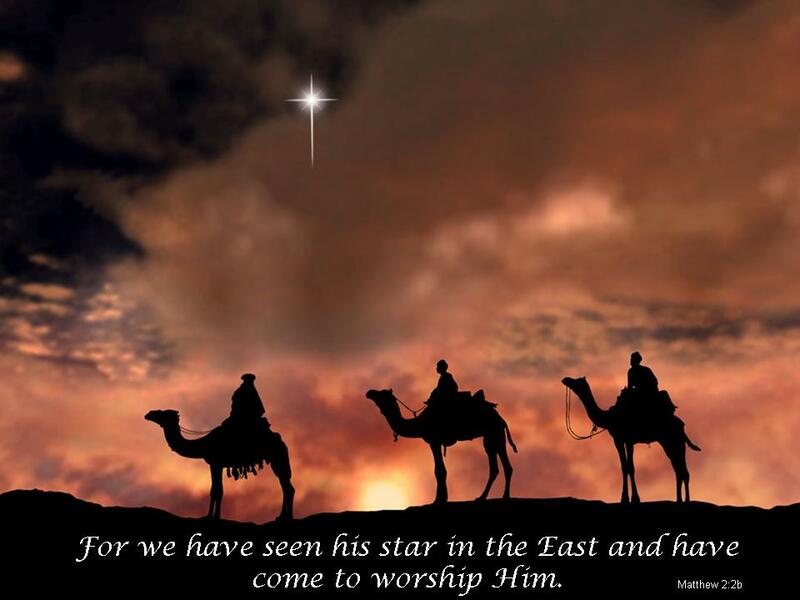 The star that the Magi followed to find the young Jesus was no ordinary star. It beckoned them to follow, it spoke to them of something deeply sacred and profound. Somehow it was interpreted to them as sign of the birth of the King of the Jews. It is thought that the star first appeared at the birth of Jesus and took them months to follow. The star, an unexplained phenomenon, was a GPS system sent from God himself and directed these men on a journey of hundreds of miles to a house, until it stood over the very house where the young Jesus lived with his parents. They knew they had found the Son of God, the long-awaited Messiah and they presented him with gifts of gold, frankincense and myrrh. They fell on their knees in worship of the Christ-child. And then they quietly slipped unnoticed out of the country. They had been divinely warned in a dream to not go back and report their findings to the wicked, jealous King Herod as they had been instructed to do. At their departure Joseph was also warned in a dream to flee with the young child and Mary immediately. Under cover of night they quickly fled for their lives to Egypt. This event set off a cruel and brutal massacre of innocent lives. Herod in his desperate attempt to kill young Jesus had all males 2 years old and younger slaughtered. This story is recorded in Matthew 2. Neither the star or the magi are mentioned in scripture again. To me the star represents something bigger and more profound than a lovely Christmas ornament. It beckons me to remember, to remember the story of wise men who obediently followed the star and in their wonder and obedience they found the Christ-child. The star beckons me to also journey and search until I find Christ-the Messiah, my Savior. And when I come into His presence my response is also to fall on my knees in worship. Two years ago I felt God laid on my heart to encourage Christians to put up a star as a way of saying, “Christ lives here”. I didn’t follow through and had planned to do it this year. I forgot. It suddenly came full force into my mind again over the weekend when we made a four-hour road trip and I did not see a single star. And here we are just a few days before Christmas again! I am asking Christians worldwide. Put up a star. Let’s light the dark evening with rays of joy that say, “Christ lives here”! Thank you for a wonderful post. It has brought a lot of the spirit of Christmas back to me. With all the advertising and commercial take on Christmas your words ring true. It is the Lords birthday. We can follow him by his light.